i edited this email completely taday (5/4/10), just to be able to keep everything in one thread. for original 1st mail see below. i hope that's okay? i am now taking orders for this project until monday, the 17th of may. BTW i think i registered all placed orders by today, the 4th of may. i won't take any money until i hold the boards in my hands, so just post in this thread, PM or email me if you are interested (following the recommendations for PCB sales on electro-music.com). This is not a beginners project. some wiring has to be done, and more than 10 ICs are placed on this 4.9x3.9in PCB. And then there is a section to provide voltage control of the gate/trigger patterns: CV in, manual pattern select (offset/fine), and two LEDs indicating the limits of the CV (<0V>5V). The patterns of the 8 steps are under the control of an ADC, however each step can be set manually too, to overwrite the ADC pattern if desired. Some time ago kind fellow CJ Miller sent me some old EFM schematics to upload them to my site. One was the ADC flash, based on LED driver ICs (LM3915). I thought about the use for an ADC module for a modular synthesizer and came up with the idea of controlling the steps of a sequencer with it. But why use expensive or hard to get LM3914/15? so I utilized an ADC0801 (or even 0804) for that purpose. This IC accepts 0V-5V input, so i put a simple CV processor upfront the ADC, with two additional comparators to drive indicator LEDs for voltages >5VA or <0C. The outputs of the ADC are converted to grey code (4030) and amplified (TL074). The 4017 based sequencer then switches these voltage on/off (4016). Each step can be manually controlled by a switch, selecting on-off-ADC - so one could overwrite the ADC. The actual sequencer section is a common 4017 based design. However I utilized inverted schmitt triggers (40106) and AND gates (4081) to create a trigger from the incoming clock and the gates of the sequencer. There are 20 LEDs: 8 for showing the pattern of the ADC, 8 LEDs showing the actual active steps, 2 LEDs for the CV processor, and 2 ELDs for the gate and trigger outputs. below you can see my two builts of the sequencer, one 1U stand alone unit, and one eurorack module. 1) bend up pins 10 & 13 of IC5 (the 40106 hex inverting schmitt trigger) - hopefully you have them socketed. 2) solder a 10k-47k resistor between these pins (right on top of the IC). i am working on a sequencer with voltage controllable patterns for a while now. it is not completely tested/breadboarded yet, but it is promising so far. some time ago kind mr CJ Miller sent me some old EFM schematics to upload them to my site. one was the ADC flash, based on LED driver ICs (LM3915). i thought about the use for a ADC module for a modular synthesizer and came up with the idea of controlling the steps of a sequencer with it. but why use expensive or hard to get LM3914/15? so i utilized an ADC0801 (or even 0804) for that purpose. this IC accepts 0V-5V input, so i put a simple CV processor in front, with two additional comparators to drive indicator LEDs for voltages >5VA or <0C. the outputs of the ADC drive discrete schmitt triggers, which switch transistors at the outputs of a 4017.
each step can be manually controlled by a switch, selecting on-off-ADC - so one could overwrite the ADC. 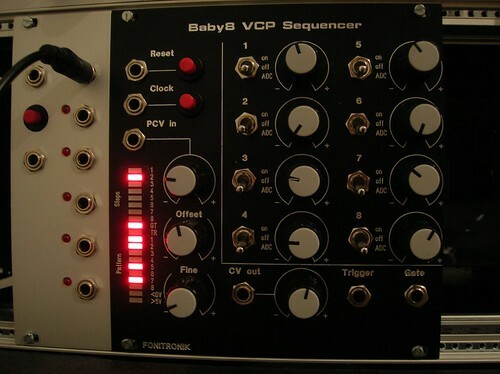 the actual sequencer section is a baby10. the AND gates and trigger pulse/stretch circuitry is not tested yet, just a sketch from the mickey mouse logic and suggestions from the baby10 thread. Cool idea but..... you should finish that sds3 first. yes, i should. the question is, if i could!? it is basically a common 8-step sequencer, and you can set the stages to on or off, as for any other common sequencer. BUT: the switches for the stages allow you to select "ADC". you can change the pattern by external voltages. the ADC generates 8-step patterns wich could be applied to the 8-step sequencer. however the complexity of 256 possible patterns adds some kind of unpredictability. but for each step you could overwrite the ADC with the switch. Is this something like the voltage control feature of the Milton? very nice! the leds indicating the voltage input level would be a good addition. thanks for the pointers, andrew. i will have a look at it. concerning the LEDs: currently i have two warning LEDs. you're suggesting a 3rd LED to indicate the actual level? i did not think of it, because i found it sufficient to look at the pattern LEDs, which give some kind of orientation due to the binary code. but hey, why not? i could drive it from the summing OpAmp, i guess. concerning the LEDs: currently i have two warning LEDs. you're suggesting a 3rd LED to indicate the actual level? it would certainly look good..isn't there a Blacet module that does just that? it would help a lot so you could attenuate the input CV to operate within a desired range. sorry to be to dumb,so what happens it changes just if a step is on or off,all steps each stay in time of the sequence,more like a programmable on/off gate function then? So the enable steps are not shifted? No manual skip function like the moog sequencer then? I think there may be a problem with the the output from the DAC with the design as it stands. For small changes in the CV, you will get Step 1 and probably Step2 being switched out of sequence. Say we have a CV range of 8V for convenience (either from the Offset or CV in). You might expect a CV in of 4V to enable Steps 1 to 4 for the sequence output, but a CV in of 3.98V say, may only enables Steps 2, 3 and 4 - dropping Step 1 because of the slight change in voltage. The lower steps will always be sensitive to small changes in the input CV. It might be worth looking at inverting the CV and/or reversing the connections of the DAC, so that the peak voltage enables Step 1, etc. This issue is only relevant if you want each step of the sequencer to follow each other, Step 1, Step 2, Step3, etc., for a set of defined input CV's. The fun with this design is that certain voltages might allow you to miss steps from the sequence, so for example 4.5V might enable Steps 1, 2, 4 and 5 (missing Step 3), 6.8V might enable Steps 2, 4, 5, 6 and 7 (missing Steps 1 and 3). So a slow speed LFO would be able to change the length of the sequence and which Steps are included in the sequence. indeed. nevertheless, for a first test i used the s&h from the TH super controller, which worked just fine. but again you are right. it is very sensitive. this is a good idea, i think. makes sense. what about a log input? An additional Log input might be useful, but it would make the panel a bit busier, especially if you need a pot as well as a jack. I've just spotted my obvious mistake as well, it should be an ADC not a DAC. I've been thinking about possible alternatives to an ADC as well. It would be interesting to see if it is possible to find a multi channel threshold comparator, something like a Schmidt trigger, but with 8 or more levels of threshold, possibly programmable by resistors. You might even be able to do this passively, with a resistor ladder and some Schmidt Triggers. I wonder if you could program a PIC to do this also? The ADC version would still be useful though, because it can miss steps out based on the CV input. A degree of randomness that would be a useful effect in its own right. Ok,i now understand,its basicaly just a sequencer where u can mute a playing step via CV,is that not a bit to overkill,u will get more variation by implementing a skip function instead,here the sequence (read 'melody') still stay the same,just notes here and there drops out. skip function would be great. i agree. however it is a little bit different, i believe. i actually wanted to achieve a kind of recallable patterns. i will build a complete module anyways and then i will see what i can get out of it. maybe i should use only 7 bits. then we would have 1 pattern per semitone for 10 octaves/10V? or two 4 bit ADCs? 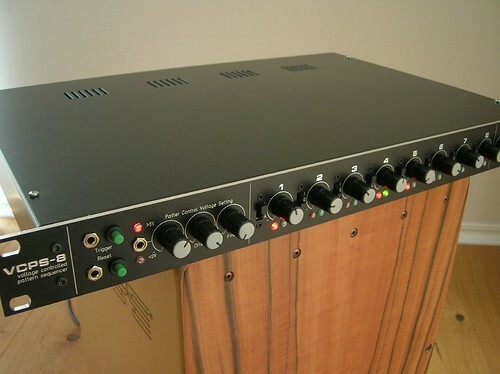 BTW, could anybody think of other possibilities to use an ADC flash in a modular? I think the idea of using CV to set the pattern is very cool. But as you noted, it can be a little discontinuous: sometimes small changes in input voltage will make big changes in the pattern and sometimes tiny (one bit) changes. The classic way around this is to use a Grey code. Wikipedia will baffle you with math and theory, but a hardware implementation (for you) is as simple as 7 XOR gates. See http://yagni.com/graycode/ and scroll down 3/4ths for a more pleasant introduction. This way, you could still have full 8-bit control of the sequence, but do so in a way that only has one-bit differences between adjacent voltages/patterns. that is a great hint. thank you very much. i thought of just mixing the bits, but that would not be as good as grey. tomorrow i will be back on breadboard. okay, i did not implement the grey code yet, but i have had a lot of fun with it tonight. BTW forget about the schematic as of today, tonight i replaced the discrete schmitt triggers by opamp buffers/amplifiers and the switching transistors by CMOS4016 switches. i reworked the AND/Trigger circuitry and withdrew the trigger lenght control. now the trigger pulse width follows the clock width. will post the new schematic soon. I love the panel and the idea of a sequencer in so little space. sure. however, i think i will build a complete module first. then i will do a demo. the first is actually incorporated already. selecting another pattern does exactly that: mute certain steps. i know, a CV for muting just one step would be different, it would be a complete different approach anyways. a reset function is implemented. it is necessary to control the pattern length anyway. the skip function: i would have to wrap my head around that. this would add at least one toggle switch for each step? will u offer pcb's for this matt? sweet! of course there is interest... put me down for 2! I'd take 2 PCBs but not until February. but maybe nearer march ? oh well we shall see.